During National Work Experience Week British Airways provided some great opportunities for students from Cardiff to gain an insight into the different areas within the organisation. The week campaign gave British Airways the opportunity to raise awareness of work experience. Students from Cardiff West Community School, Fitzalan High School, Radyr Comprehensive School, Ysgol Glantaf, Ysgol Plasmawr and Willows High School were given the opportunity to have an interactive tour of BA Interiors in Blackwood, as well as activities to gain an insight into the work involved with that particular area. During their visit the students had the opportunity to gain an insight into roles in Engineering. Students had a tour of the engineering workshop, and were able to see first-hand the variety of work that is needed to maintain BA’s fleet of over 300 aircraft. 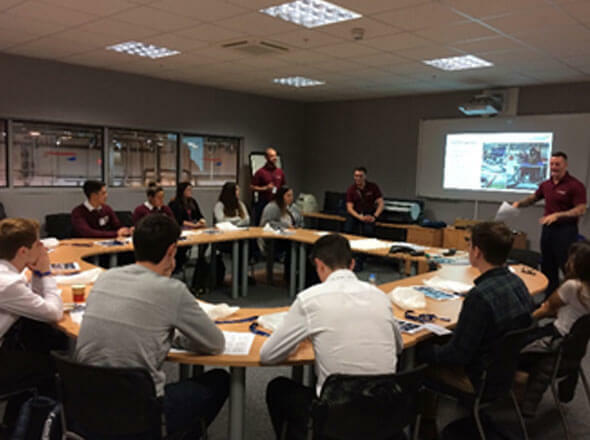 The day gave students a better understanding of engineering roles in British Airways and how the behind-the-scenes work contributes to the operation.